I have enlarged my vocabulary and found a routine that makes me feel much more confident when contacting our customers and partners. With today’s fast paced lifestyle, maybe you don’t have time for an intensive English course. Perhaps you travel too much to commit to a weekly class. If this sounds like you, don’t worry. There are other options out there…You could learn English online! Give it a try for free! Receive daily English lessons with personalized e-mails from Gymglish. Each lesson follows the adventures of the San Francisco-based Delavigne Corporation and its staff. You will gain access to featured business content, which makes use of humor, various accents and more proven tools for learning English. 1. You’ll receive a daily e-mail each morning with a variety of written and audio content. Each ten-minute lesson includes a story based on the Delavigne Corporation with conversations, questions, mini-lessons and revisions. 2. After clicking ‘send’, your email corrections will be sent to you along with your score of the day. Here you will find explanations on each question, audio transcripts to read through, your hand-picked vocabulary lesson, and much more. 3. Each lesson is customized based on your previous results, your expectations and your needs. Gymglish uses a complex algorithm to develop a personalized lesson for you every day. 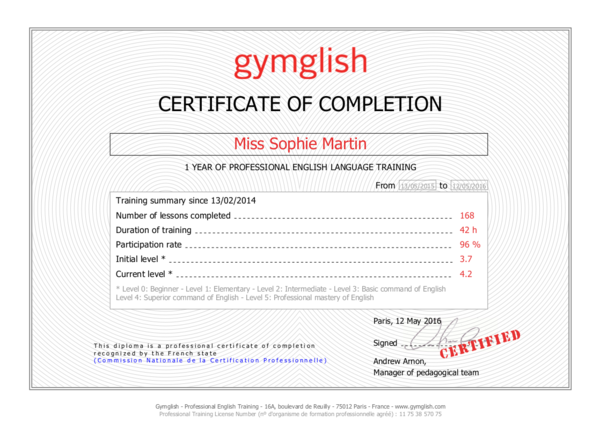 After you have finished your online English course, Gymglish will provide you with an official Certificate Of Completion which includes detailed statistics on how much progress you have made and your participation rate. Learn English Online, And Have Fun Doing It! Improve your English in only 10-15 minutes per day. Follow the adventures of the Delavigne Corporation in San Francisco. I am a fan of my English lessons and I really appreciate the work carried out by the Gymglish team. After all these years, I’ve finally improved my English and now I have no problem understanding conversations or watching films without subtitles. Gymglish’s English lessons use a non-traditional approach! They helped me improve my skills in only ten minutes a day! Now it’s easy for me to speak English and understand conversations! Improve your English at your own pace with a fun and challenging method! A professional English training program designed to improve the English level of your staff. An effective and creative tool for university students looking to learn English online. Gymglish is an ideal addition to the English courses taught by our teachers. Want to improve your international appeal? Let MLI guide you on a course to better Business English. Emails? Presentations? Telephoning? With lessons focused on the grammar and vocabulary needed around the office, you can be confident you will have the tools necessary for success in today’s international business world. Start today! Do you need an English website? CV? Important proposal for a foreign client? Looking to expand your market share? You will need your documents professionally translated. Already translated? Have an expert native speaker proofread them. Don’t leave it to Leo! The MLI Team is a dynamic group of experienced native speakers, dedicated to making language learning fun. With homelands from around the world, we bring an unrivaled international experience to the classroom. Whatever your language learning needs, we have a teacher who is right for you. Check us out!